The South African economy has struggled over the past few weeks as reports of unrest in the country’s mines drove down the equities of most local miners. The current round of protests in South Africa's mining industry first broke out in mid-August at Lonmin's (LON:JSE) Marikana platinum mine when 3,000 workers went on strike, demanding that their wages be tripled from R4,000 (just under $500) to R12,500 ($1,540). Now, with thousands of workers on strike in platinum and gold mines, worries over South Africa’s mineral production, a country burdened by a violent history, is not helping the sector. Citigroup’s chief emerging markets strategist issued a statement earlier this month, saying these strikes are likely to increase the risk premium in the country’s economy. A Reuters poll on Thursday showed economists keep their median forecast for growth of 2.5% this year, after trimming it in last month's survey. However, some in the poll of 17 analysts were more bearish and project a mere 2.2% expansion. The country’s mining sector, which accounts for 6% of gross domestic product, has been repeatedly hit by disputes over low wages that reflect widespread anger over enduring inequalities. Reuters’ poll expects interest rates to remain unchanged for this year and next year at a 40-year low of 5.0%. The poll also has them rising by 100 basis points by the end of 2014. Nationalization is another damaging topic in the South African agenda, according to The Wall Street Journal. The paper said the labour strife has put overseas investors on edge not only because of the deadly violence involved but also because of local political figures talking of mine expropriation. Malema also called on miners to continue their strike and prevent work from being carried out. 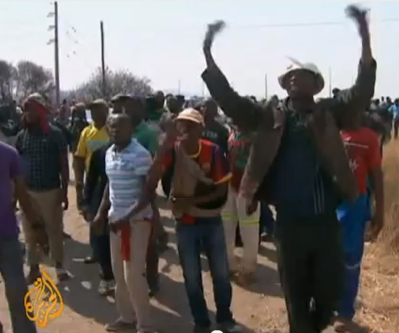 Image: Miners striking, by Aljazeera via You Tube.